For product quality and structural integrity, drying plastic resin prior to forming is a crucial process step. Molding and extruding machines used for processing moisture-sensitive material normally feature a drying unit of some type in proximity to the resin feed hopper. Typically, this unit has been an electric resistance dryer which processes air and a hot-air supply to regenerate the moisture-removing drying medium, referred to as a desiccant. These dryers normally take several hours to dry the resin, so processors have long been concerned with how to shorten this drying time. Gas-fired resin dryers also use forced air to remove water from moisture-absorbing plastic resins. But they allow processors to dry more material in less time with significant energy cost savings over their electric counterparts. Gas-fired resin dryer features and operation vary by manufacturer. The typical dryer consists of two separate heating systems, one for process air and one for regenerating the desiccant. The process air is forced through the desiccant and dehumidified. The heated air is then circulated through the hopper containing the moisture-laden resin. Moisture-laden air then passes through a filter and back through a desiccant cartridge. The cycle then repeats as the dehumidified air is reheated and delivered back to the drying hopper. The dryers utilize several desiccant cartridges on a rotary turntable. When the desiccant in a cartridge becomes moisture-laden, it is rotated to a regeneration station where hot air dries it out. The cartridge then rotates further to a cooling station. When sufficiently cooled, it is ready to go back on line. 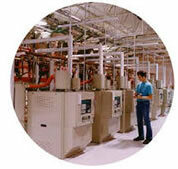 The process heating system warms air to 160-325ºF for its part of the process. For regeneration its system must heat to 425ºF.